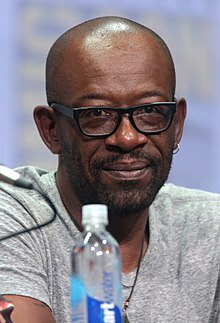 لنی جیمز (اینگیلیسجه: Lennie James) بریتانیالی فیلمین سناریو یازاری و اوْیونچو. ۱۱ اوْکتوبر ۱۹۶۵ ‏ ایلینده دۆنیایا گؤز آچیب. 1988–گۆنوموز ایللر آراسیندا سینما ساحه‌سینده چالیشیب. 1988 Screenplay Writer Episode: "Between the Craks"
1990 The Bill Writer Episode: "Burnside Knew My Father"
1994 A Touch of Frost DC Carl Tanner Episode: "A Minority of One"
1994 Love Hurts Steve Episode: "Parent Trap"
2004 Family Business Roy Tobelem Episode: "#1.1"
2005 ShakespeaRe-Told Oberon Episode: "A Midsummer Night's Dream"
2006 Spooks David Newman Episode: "Agenda"
2009 Lie to Me Terry "Tel" Marsh Episode: "Grievous Bodily Harm"
2009 Three Rivers Dr. Maguire Episode: "Alone Together"
↑ . 2014-09-11. 4:30 (Voice and Motion Performers). http://www.ign.com/videos/2014/09/11/destiny-end-credits. Retrieved 2014-12-04. ↑ . 2017-09-07. 7:10 (English Voice and Performance Cast). https://www.youtube.com/watch?v=j-OoT-Zfyto. Retrieved 2018-02-14. ↑ First black 'Baftas' are used to show discrimination in awards (10 September 2002). یوْخلانیلیب1 November 2016. ↑ Online Film & Television Association. یوْخلانیلیب1 November 2016. ↑ ‘Breaking Bad,’ ‘Parks and Rec’ win big at Gold Derby TV Awards! (18 September 2013). یوْخلانیلیب13 April 2017. ↑ RTS Programme Awards 2013 | Royal Television Society. یوْخلانیلیب1 November 2016. ↑ RTS Programme Awards 2014 | Royal Television Society. یوْخلانیلیب1 November 2016. ↑ The 2016 FANGORIA Chainsaw Awards Winners and Full Results!. یوْخلانیلیب1 November 2016. اینگیلیسجه ویکی‌پدیاسی‌نین ایشلدنلری طرفیندن یارانمیش«Lennie James»، مقاله‌سیندن گؤتورولوبدور. ( ۲۲ ژانویه ۲۰۱۸ تاریخینده یوْخلانیلیبدیر). قارداش پروژه‌لرده لنی جیمز گؤره داها آرتیق بیلگی‌لر تاپابیلرسینیز.